In the northeast March isn’t the month that beckons us out into the garden. In some states the snow cover remains while in other areas we almost wish that the white stuff was still hiding the brown, dead landscape. On close examination there are signs of spring: buds swell on twigs and the tips of perennials poke though the ground. March is a great month for pruning and I spent much of Saturday toting my loppers, shears, and pruners from shrub to shrub. The air was crisp but the sun has a great deal of warmth at this time of year, so soon I worked up a sweat as I chopped and trimmed. It was the perfect outdoor activity for early spring: I didn’t have to kneel on the damp ground, I was accomplishing something that needs to be done, and things on the to-do list were being crossed off, one by one. Now and then I yanked some clumps of chickweed out of the gardens. Do I wish that it was time to put veggies in the garden and annuals in the flowerbeds? Of course. Would I rather be planting in shirtsleeves instead of cutting limbs in a winter jacket? Naturally. But once I was outside and working it was the combination of movement, fresh air and achievement was totally satisfying. There are occasions in life when for one reason or another it isn’t the season to do what we’d really prefer. These are moments when our choice is to lament that we’d rather be doing something else, or to step in and accomplish what can be done at that time. Every person has many “months of March” when they find themselves in between dormancy and fast growth. Will we use these as an excuse for inactivity, or will we find the opportunities for action? 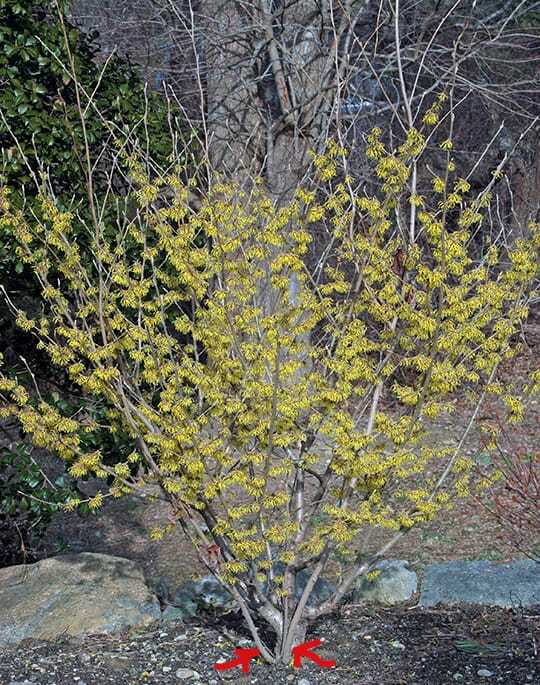 I will wait for any actual pruning until after this witch hazel finishes flowering, but I can already see that there are some "suckers" that are coming from below the graft. I'll cut these off immediately. In general, prune summer-flowering shrubs in the spring and spring-flowering shrubs right after they finish flowering. March is the time to prune butterfly bush, rose-of-Sharon, pee gee hydrangeas, pink flowering spirea, potentilla, Vitex and Caryopteris. These plants are easier to prune before they break dormancy since you can see their structure well. In March you can lightly shear the winter damage off of boxwood and Japanese holly, or prune back other evergreens such as yews and Leyland cypress. You can also wait and prune evergreens later in the spring. March is the perfect time to look for growth that has come from below a graft. Watch for long, straight shoots that look different from the other parts of a shrub. This is often noticed on contorted filbert, aka Harry Lauder’s Walking Stick, for example. Cut these shoots off at soil level. Watch for winter damaged plants when you’re in the garden in early spring. Broken or bent limbs can be removed anytime.